How habit tracking can help you break bad habits and reach personal development goals. The tricky thing about habits, is that we don’t really think about them. Habits are, by nature, instinctual. They are things we’ve done so many times that our bodies no longer need a lot of conscious effort to complete them. Little things like, locking the door behind you when you leave the house, or turning off the stove when you’re done cooking, are done so frequently, that we typically only need a reminder to do them if something interrupts us, or we change our usual pattern of how we do them. This is great in those two scenarios, because you definitely want to lock your door or turn your stove off. Unfortunately, bad habits can be just as powerful and undetected. You may not think about reaching for a soda with every meal, or automatically turning on the TV as soon as you get home, but you’re still doing it. That’s were a habit tracker comes in. You don’t need a habit tracker for things like locking the door, but you do need one for things like working out, drinking enough water, and practicing self-care. These are things we need to do, but don’t always do as often as we should. There are also negative habits as well, like eating too many sweets, biting your nails, or forgetting to do your laundry. These are things that we’d like to stop doing, but can’t because they’re ingrained. For all of these, tracking can help you improve. They say it takes over twenty repetitions for something to truly become a habit. Time wise, this usually works out to about a month of self-discipline, and dedication–assuming you never slip-up. Obviously, changing your habits is a long-term process, that takes a lot of work. You have to focus on your goals for your habits, and you have to practice them daily. That’s where trackers come in. They can help keep you more accountable, so that you know whether or not you’re putting in enough effort. They can also help you see how to best spend those efforts, so that you’re not wasting your time. The key is in the data collection aspect of it. By tracking how often you complete a habit, you can get a better sense of how successful you are at continuing or eliminating it. Reflecting on the data will also tell you what you need to change in order to maximize your efforts. It’s easier to identify what might be holding you back when you’ve kept yourself accountable for every day. It’s also just a really nice reminder to keep going. Journaling is one easy way to start tracking your habits. I highly recommend setting aside a journal, or a section in your journal. If you’re not sure how to start here are three types of habit trackers that I use, depending on the habit. This is the most basic type of tracker. With static ones, you’re not really trying to build a habit, you’re simply recording how often it happens. For these, the purpose is more about having the data, rather than acting on it. If you’re getting serious about your goals, or about changing your habits, I actually recommend starting here. Before you decide on a plan to change something, look at how many times you’re actually doing it. For example, if you want to work on watching less television, take a week or two to record how much TV you actually watch, and maybe any contributing factors. This data can help you best determine how to set a goal to change that habit. It’s also great to use if you have a habit that you like, and want to keep up with. For example, if you’re trying to learn a language, you can keep track of how many hours you do a week. This will help you understand your progress, and seeing the amount can also encourage you to do more. For this type of tracker, you are recording how many times you do or don’t do something, with a specific target amount in mind. At the end of the week, regardless of whether or not you succeeded, complete a reflection. Talk about things that helped you, and things that might be holding you back. From there, decide whether or not you want to adjust your target amount. If it’s a habit that you really want to build, I recommend setting a smaller target for your first week or two. As you get more accustomed to your habit, increase the target every week or so, until you’re regularly achieving an amount you like. With comparison tracking, you’re trying to record how many times you do something, in comparison to something else. Essentially, it’s two trackers in one, both of which may or may not have a target attached. This type of tracker works great with negative habits, because you can use it to track your replacements. It makes it very obvious whether or not your chosen replacement activity is actually making an impact. I actually prefer apps over journaling for some smaller things, like drinking more water, or not snacking as much. It’s easier for these sorts of habits, because your phone is going to be with you all day, allowing you to input data in real time. As soon as you drink that water bottle, you can record that in your app, and then you’re done. No need to try and remember at the end of the day. The ones on this list are all free to download, although some do require you to pay to unlock other features. If you find an app you really like, the obviously it’s a worthy investment. However, if you really just don’t want to spend the money, just mix and match. The majority of them have the same features, so what’s premium on one app may be free on another. It’s a bit more of a pain to juggle multiple apps, but you can use them to track different categories in order to help keep your organized. This app is more helpful for people who want to do target tracking, as it’s structured to be goal based. It’s a little less streamlined than Done, but it’s still fairly easy to input habits and view the data. I would consider this to be the most complicated one on the list, but that’s not a bad thing. It’s great for anyone who wants to be serious about their tracking, or who needs more options. You can get pretty exacting with your requirements for each habit. One feature I love about this app is that they have a calendar where you can input notes for any specific days. It’s great for those scenarios where there might have been an unusual a reason for you not to need your target on a given day. It’s also helpful for daily reflection. I included this app because it has a social aspect that I think it really interesting. The basic premise is you are trying to care for a plant, which only grows if you meet your goals. What I like about this app, is that they add a social function as well, allowing you grow plants with other people, and to show off your garden. 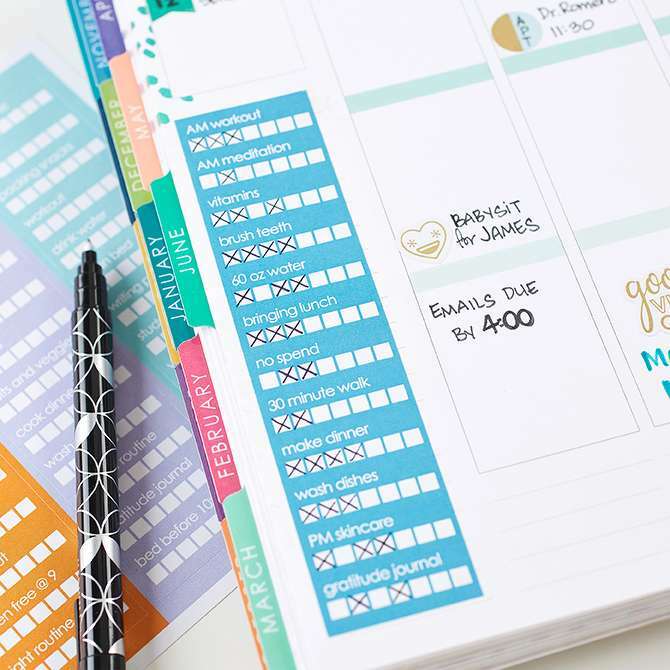 It’s a fun way to incorporate more accountability into your habit tracking. Regardless of your method for tracking, or how serious you want to be with your efforts, reflection is key. You can’t expect to change if you don’t look back on your data and decide what to change and what to keep. I highly recommend keeping a separate section for reflection in a journal, even if that’s not where you’re tracking. Give yourself the space to write as little or as much as you want about how you’re doing. If, understandably, you don’t have time for that, at least sit down at the end of every week and review your scores. Even just taking those few extra seconds to look at how you’ve done can help you moving forward. With any tracker, remember that judgment is not the goal. Habits are difficult to break, that’s why there are so many methods and resources available. With that in mind, remember that you’re going to fail. In fact, you’ll probably fail regularly when you’re starting out! Those failures should not deter you. The goal is to improve, not to be perfect. As you’re reflecting on your data, be objective. Don’t judge yourself for failing to meet your target, or not seeing any improvement in your comparisons. Consider what contributed to you missing your target, and make the adjustments for the following week or month. Habits can feel like they’re set in stone, but that’s not the case. With a little time and effort, you can break bad habits and develop new ones. Tracking can help you with that. It’s a great way to keep a record of what you’ve done and what you can do to improve. You don’t have to feel like you’re stuck in bad habits, by tracking your habits you can initiate positive changes in your life.